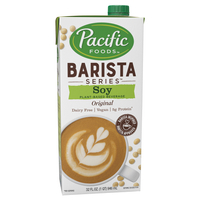 INGREDIENTS: Organic Soybase (Water, Whole Organic Soybeans), Cane Sugar, Contains 1% Or Less Of: Carrageenan, Dipotassium Phosphate, Expeller-Pressed Canola Oil, Natural Flavor, Sea Salt, Sodium Citrate. 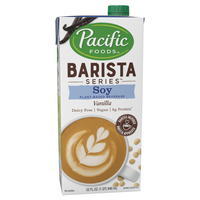 INGREDIENTS: Organic Soybase (Water, Whole Organic Soybeans), Cane Sugar, Contains 1% Or Less Of: Carrageenan, Dipotassium Phosphate, Expeller-Pressed Canola Oil, Natural Vanilla With Other Natural Flavors, Sea Salt, Sodium Citrate. 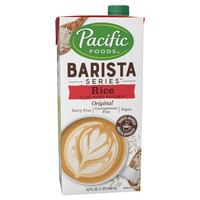 INGREDIENTS: Water, Rice, Contains Less Than 1% Of: Disodium Phosphate, Gellan Gum, Locust Bean Gum, Natural Flavor, Potassium Citrate, Rice Bran, Sea Salt, Sodium Citrate, Sunflower Lecithin, Sunfower Oil, Xanthan Gum. 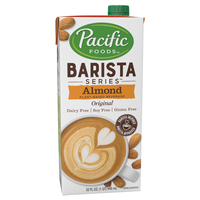 Not a significant source of saturated fat, trans fat, cholesterol, dietary fiber, Vitamin D, calcium, and iron. 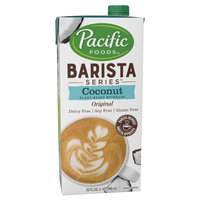 Perfect for signature blended beverages, our Pacific Natural Frappé & Smoothie drink base is an easy-to-use, shelf-stable base made with organic milk, that produces the richest and creamiest drinks. Time and time again. And it's that easy. 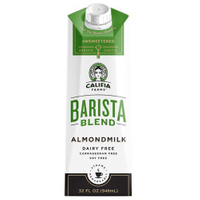 Simply blend to create indulgent frappés or smoothies that you're sure to love. 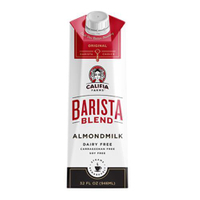 Califia Farms Barista Blend Oat Milk is specially formulated to perform in coffee based beverages. 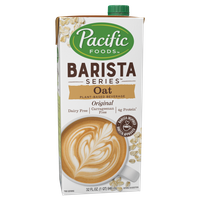 It has remarkable steaming capabilities and a taste so good you can drink it by itself. 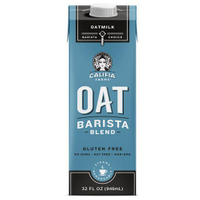 Barista blend oat milk is made from oats grown in North America, and without any gums or stabilizers for a clean blend you can feel good about serving.